I have long been a fan of paper products, stationary, post it notes, etc. It is only natural that I would love planners. 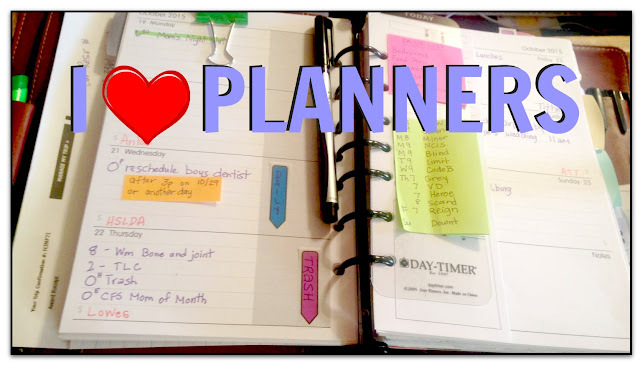 Since I am geeky about creating planner inserts (and other printables), it's like I have the best of both worlds. I get to spend time creating and designing inserts, and then I get to turn around and use them! As I look at my weekly planner spread, such as the one for this week, pictured above, I feel very content. Maybe that's because I know there is a plan in place. As long as I look at my plan, I'm not going to forget that I have an 8am appointment tomorrow or that one of the boys needs to put the trash on the street before Friday morning. There's appointments on Thursday, Friday school coming up, a wedding on Saturday as well as a trip to the airport and one to see my family. Those are not big, major deals but there are a lot of details flying around and I have corralled them nicely in my planner. That is what I call planner peace. Share with me! What do you love the most about your planner?